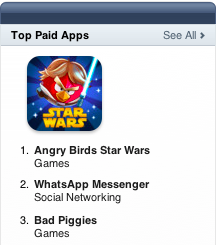 Rovio launched Angry Birds Star Wars yesterday and already the game has become the top paid app in the U.S. and Canadian App Stores. Angry Birds Space broke 20 million downloads in less than a week and was deemed the fastest growing mobile game in the world back in March. Will it be topped by Angry Birds Star Wars? Rovio’s continued success with the franchise has been impressive on all levels. Did you help contribute to the rise of Angry Birds Star Wars?